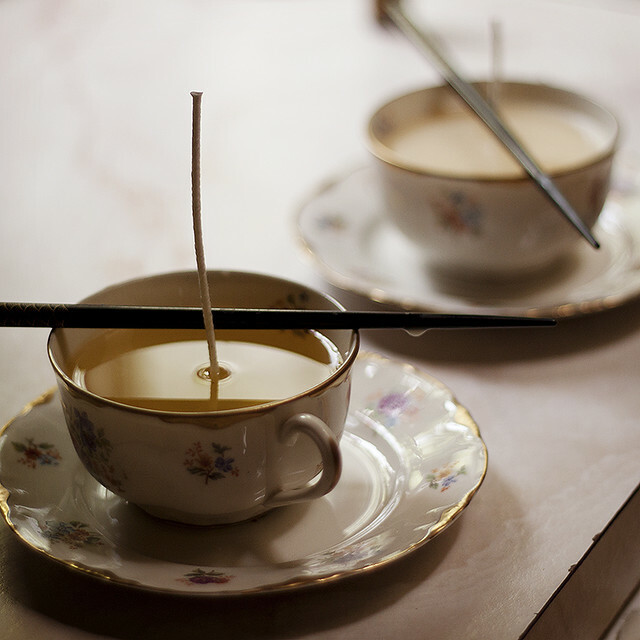 the tea conjurer: DIY: teacup candles. This little craft project is a great way to spend an afternoon, and a great way to repurpose teacups that might be cracked/chipped, or could be used as a charming gift idea with an undamaged teacup! 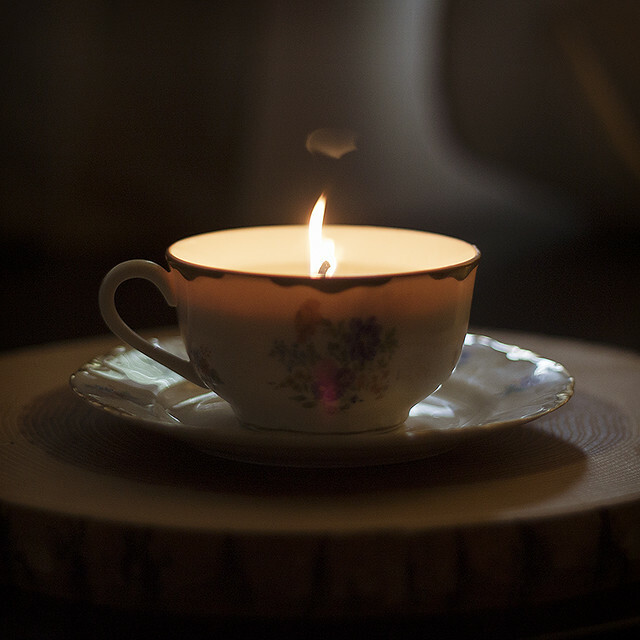 If you are making a single candle at a time be sure to measure out 2 teacup-fulls of the flakes. Every teacup has a slightly different capacity so I had better luck just scooping soy wax flakes into them, transferring to microwave-safe container, and melting from there. Didn't waste a drop of wax! The microwavable wax melts down. If you measure out 1 cup of the dry wax flakes, you'll be left with a 1/2 cup of melted wax for pouring. Keep that in mind when buying wax as well -- you'll likely need twice as much as you think! I found a shop on Etsy that sold wicks with the little metal attachment at the base along with the fragrance oil I was seeking, but you can find similar supplies at your local craft shop! I microwaved the wax flakes for 30 seconds at a time. You don't want to overheat the wax, and risk breaking the microwave-safe container or potentially causing terrible burns upon removing container from microwave. I stirred the wax every 30 seconds, and when it appeared mostly liquid with a few bits of floating unmelted wax, I carefully removed the container from the microwave with oven mitts. It will be hot, proceed with caution. Add a few drops of your fragrance oil. Stir thoroughly, and then pour slowly into your teacup. Add the wick, and use a chopstick to ensure that it will not fall. In the top photo my wick was a bit long, and caused it to lean a great deal, but I trimmed it down and let it lean on the chopstick until the wax cooled. I let mine cool for 8 hours until lighting one up and seeing how it burned. These make great gifts. Not only are you providing a cute decoration with pleasant perfume, once the wax melts down, the recipient will have a lovely little teacup to use! Soy wax washes out fairly easily from these teacups with soap, hot water, and [delicate] elbow grease. Disclaimer: It goes without saying to practice standard fire safety procedures with these lit candles. 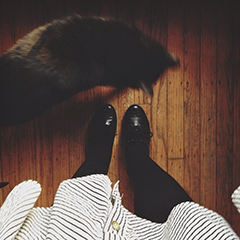 They are open and exposed, unlike candles in jars, and as such are easier to accidentally brush, or knock over. Do not leave your candles unattended. Be mindful of pets or children that might come into contact with a decoration like this.